A spontaneous pre-ship day trip to the comic shop this Tuesday met me with the sad disappointment of seeing SO many issues of the brand spankin’ new Storm #1 still left on the shelves. After the shock wore off, I hunted down the clerk to make sure it wasn’t just a reorder. Alas… There are so many great reasons to pick up this comic right there on the cover — –the pretty by line boasts the inimitable Greg Pak who does good story… that stunning artwork that caught your eye, that’s the badass Victor Ibanez (and obviously dope colorist Ruth Redmond), who’s got mad cred for his work on Constantine, Ghost, Superman, Batman, Wonder Woman… And of course, there’s STORM! — And once you get past the cover, the comic itself is pretty gosh dern amazing too. But hey if that’s not enough to get you to bust out that $3.99, maybe some of these reasons will give you the nudge. 1. Storm #1 is literally the only mainstream solo comics series led by a Black Female Superhero right now. Isn’t that crazy?! Though Marvel has stepped up with a bunch of female solo comics and female-led series, few of them are led by superhero women of color. Storm is pretty much the most popular Black Female Superhero in comics, and supporting the Storm series means supporting a more diverse comic shop shelf! 2. Storm is roughly 100 ba-gillion times cooler than Halle Berry. 3. This is her first ongoing solo title! Aside from two 4-issue miniseries in 1996 and 2005 respectively, Storm has led the X-Men team many a time, but has never had her own ongoing solo title. Yes, yes, neither have a lot of the X-Men, but Cyclops, Wolverine, Bishop, Cable, even Sabertooth(!) and a few others, all had their own solo titles at one time or another. And as one of the most popular characters and the frequent leader of the X-Men, Storm’s time is way overdue. 4. She is one of the oldest and most popular Black female superheroes in comics. Don’t even look up the stats, just go ask anyone to name as many Black female superheroes as they can, ten bucks 90% of those lists start (and many (sadly) end) with Storm. And it’s about time we got the chance to dive into more of that. The daughter of an American photojournalist and a Kenyan princess of a witch-priestess tribe… growing up in Harlem and Egypt, where her parents eventually die in the Suez Crises…Surviving as a street urchin and thief on the streets of Egypt…Worshipped as a goddess in the Serengeti… Shacking up with Black Panther… The woman has had one seriously interesting life and Greg Pak is sure to draw on that rich history to do the woman justice. 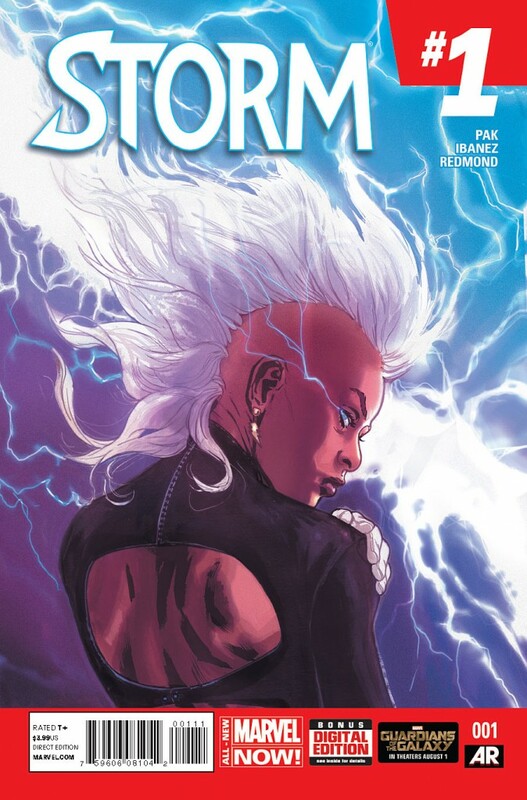 Storm #1 already has her evaluating the was she has changed since she’s joined the X-Men, which may hint at a potential back-to-the-roots direction for the comic*. In Pak’s interview with CBR, he proved he knows his Storm history: “Storm’s been a street thief and a goddess and a persecuted mutant and a queen. She’s seen it all, from every level, and isn’t always necessarily going to side with mutants first and foremost. So there’s the potential for some rich drama and conflict right there.” Can’t wait to see how it plays out! Now go get the damn comic. Corrected: We previously mentioned that Storm #1 saw Storm go back to her home continent. Thanks to the awesome Victor Ibanez, we can correct that, as the setting was actually Santo Marco in the Caribbean, not Africa. Previous Previous post: The *Actually* Super “Not So Super Comics” Is Going to Print! Next Next post: Remember This?? URSULA K. LEGUIN’s *Badass* Response to Syfy’s WhiteWashed EARTHSEA Adaptation? So fierce. Thanks for the recommendation!